Wow, I'm mentally disturbed right now. I just watched the Sardinia episode of Bizarre Foods, and I think it totally topped the worst most disgusting foods I've ever seen eaten before. I know that aging cheese can be a long and difficult process, but the two cheeses that I saw on this episode was enough to trigger my gag reflex. Gross. I was in Sardinia a few years ago, and I left it with some amazing memories of great architecture, wonderfully friendly people, gorgeous beaches, and delicious food. Now I have a feeling that this episode will always leave a small stain on that experience. Did anyone else see this episode? Moving on.... I was in the mood to go with a bright berry color and settled on using GOSH Berry Me, a highly pigmented berry wine cream. The formula on this was amazingly smooth and easy to apply, and possibly one of the best drugstore polishes I've had the pleasure of using. I could have gotten away with one coat, but I used two to be safe. No topcoat so you can see its natural shine. I really love how complimentary this shade is against my skin, and I think it would probably work well with most skin tones. 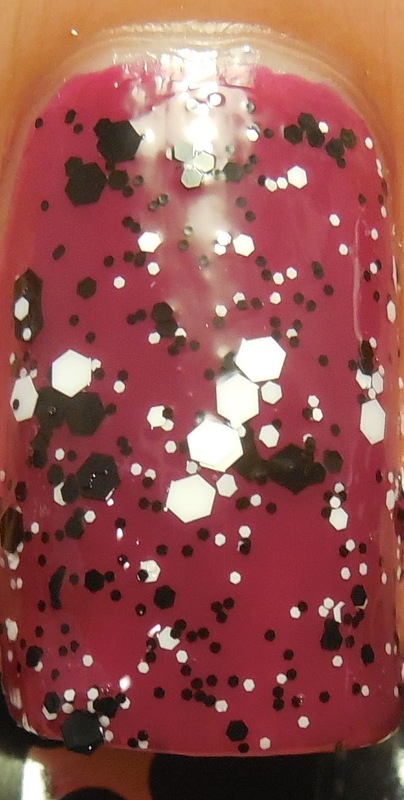 I though this gorgeous color would be a great canvas for Maybelline's Clearly Spotted. 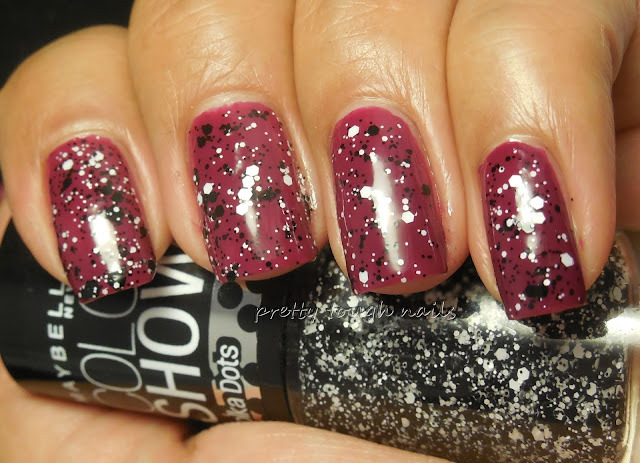 Clearly Spotted is their version of matte black and white multisized hex glitter in a clear base. 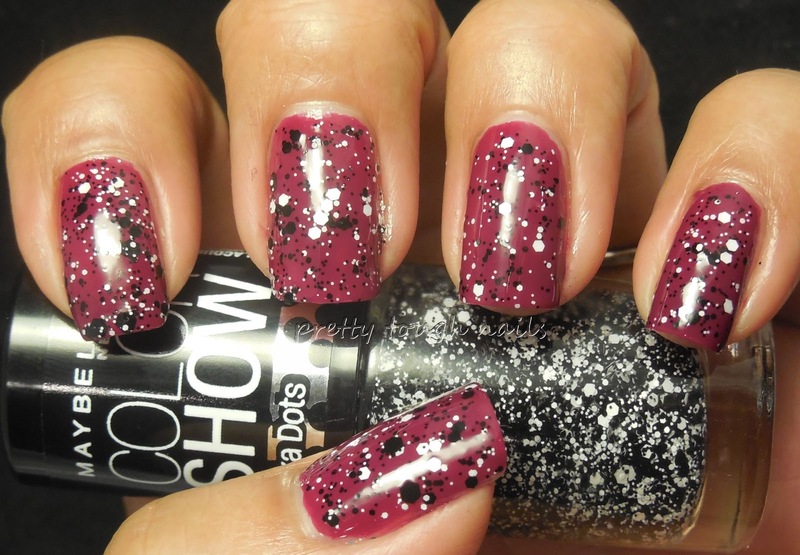 I had no trouble with application - the glitters didn't stick together and they spread out nice and evenly. This was finished with a layer of Essence Gel Look Nails to help smooth out the finish. There are so many drugstore brands that are coming out with this now classic combination, and it's wonderful to see that they each have a unique take on the combination. I do miss the bar glitters, but the hex only glitter variation is a fun change of pace. Compared to the other mainstream black and white glitters, this is probably my favorite so far in terms of formula, application, and density. Have you tried any lately? OMG Thithi! My significant other ADORES Andrew Zimmern! I mean, Andrew Zimmern is like a god to him. We haven't seen the Sardinia episode but I get to watch Bizarre Foods far more often than I would like. Don't even get me started... raw organ meats fresh from the carcass, testicles from every creature known to man, congealed blood aged underground, rotting tofu, sea squirts jellied in their own iodine, connective tissue from here to eternity and then there's the south east Asian episode that made me throw up in my mouth a little bit FOR REAL -- that show is INSANE and Andrew Zimmernut is a dandified epicurean crack ho! 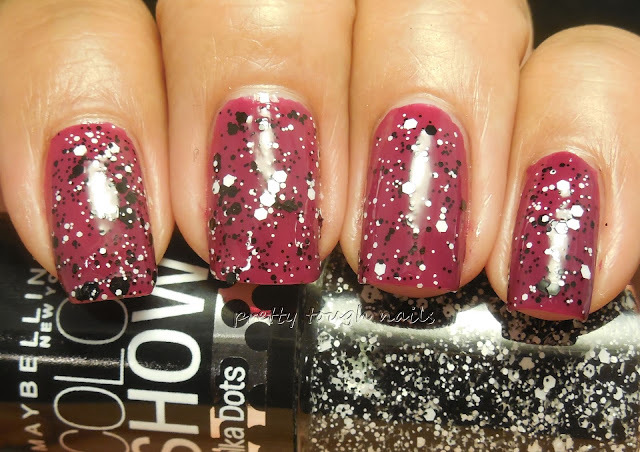 On another note, love this manicure! Great look. That Gosh sure is pretty, it has that fetching translucent glowy look to it like jelly polishes do. Sweet! LOL... I usually don't mind Andrew Zimmern and I think his goofiness is endearing, but there's only so much that I can watch of him eating nasty bits. I try not to watch that show unless there's absolutely nothing else on TV, and we were drawn to the episode because we wanted to see what he'd eat in Sardinia. It's like a bad wreck, it's so hard to look away!! AND LOL at dandified epicurean crack ho! I think I disagree with the phrase though. He's definitely not a dandy! LOL. I think you can still find it! it's still relatively new! or maybe try the new milani black and white glitter.